Drawings, Drive wheel section, and Cylinder section, now available. All other castings available by prepaid order. Please inquire. The original Yankee Shop/Friends Models 1" scale 4-4-2 Atlantic. It is a model of Southern Pacific's #3000. Built by Lester Friend. 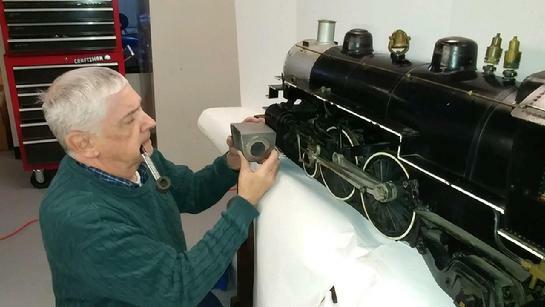 Doing his best Lester Friend imitation, Richard Symmes holds up one of the Atlantic's cylinder castings to the actual locomotive that was built by Lester Friend in the late 1940s. The tobacco pipe he's "smoking", is Lester's actual pipe. This is me with Lester Friend's Atlantic. Please note that I am holding Lester's actual tobacco pipe, too! In the late 1940s/early 1950s, Lester Friend added a 1" scale Atlantic to the product line. The Friends Models 1" scale Atlantic uses slide valves with "dummy" piston valves; it has Baker Valve Gear (Lester LOVED the Baker Gear!) and a "Delta" trailing truck. It is a powerful locomotive, very good looking, FAST, and quite robust. It is modeled after the "Southern Pacific" style of locomotive, #3000 class; but it has a style all its own and as such, it looks very much like S.P. #3000, but has a character all its own. 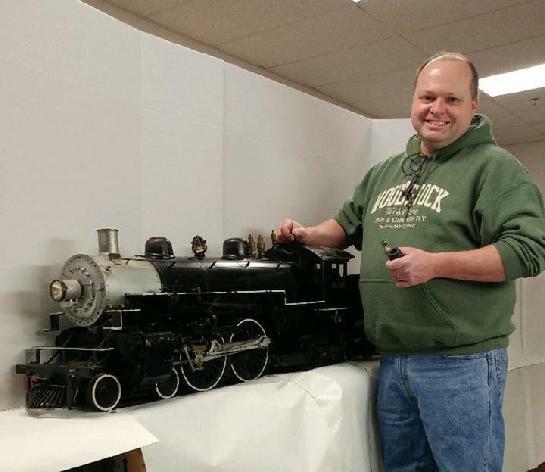 I was asked to produce critical castings for the 1" scale Atlantic locomotive. Wheels and cylinders are available at this time. All other components for the 1" Atlantic shall be available on a prepaid basis, for any prior purchasers of the drawings, drive wheel, and cylinder sections. Domes, stack, pilot truck, front beam, saddle, cradle, valve gear parts, trailing truck, smokebox front, tender trucks, etc. Thank you for your interest in this classic design from the late 1940s. DRAWINGS for the Atlantic are available below. Please note, Lester Friend did not produce tender drawings for the Atlantic. For these, he often advised his customers to "follow their own minds". However, in the construction articles that he wrote for this locomotive, he did describe the construction of the tender, as well as give critical dimensions. 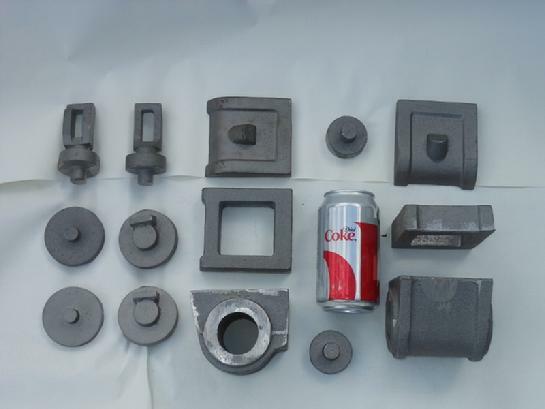 Also, tender truck castings and drawings were produced by Lester Friend, and are available. Formal tender drawings will be made up, as time allows, and subject to sufficient interest & sales in the engine castings. Thank you! Please click the Paypal link at right to purchase your 1" scale Atlantic drawings. $195.00, plus $25.00 USA Shipping. For other countries, please inquire. Click the Paypal link at right please, to purchase your Atlantic Construction Articles, a series of 11 installments published by Lester Friend in the early 1950s. Price $30 plus $8 USA Shipping. For other countries, please inquire. 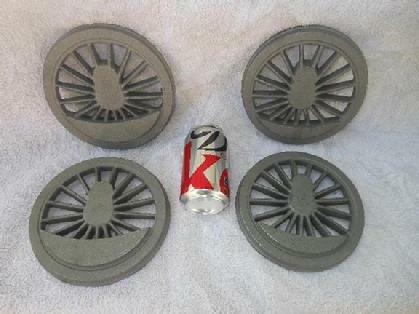 The drive wheels for the 1" scale Atlantic. 6-5/8" diameter. Set of 4 wheels, 2 heavy and 2 light. Click the Paypal link at right to purchase your Atlantic drive wheels (set of 4 wheels: 2 light, 2 heavy). Diameter 6-5/8". Price $500 plus shipping, to the USA. For other countries, please inquire. Cylinder section includes left and right cylinders, steam chests, steam chest covers, front heads, rear heads, front steam chest head, and rear steam chest heads/valve crosshead guides. Cast iron. The cylinder section for the 1" scale Atlantic. Includes cylinders, steam chests, steam chest covers, front cylinder heads, rear cylinder heads, front valve heads, and rear valve heads/valve crosshead guides. Click the Paypal link at right to purchase your Atlantic cylinder section. Price $960 plus shipping (USA). For other countries, please inquire. The remainder of the castings for the Atlantic will be produced on an individual basis for anyone who has purchased the drive wheel section, the cylinder section, and the drawings. Payment terms: prepayment at the time of your request. Delivery 6 months. Thank you for your interest. 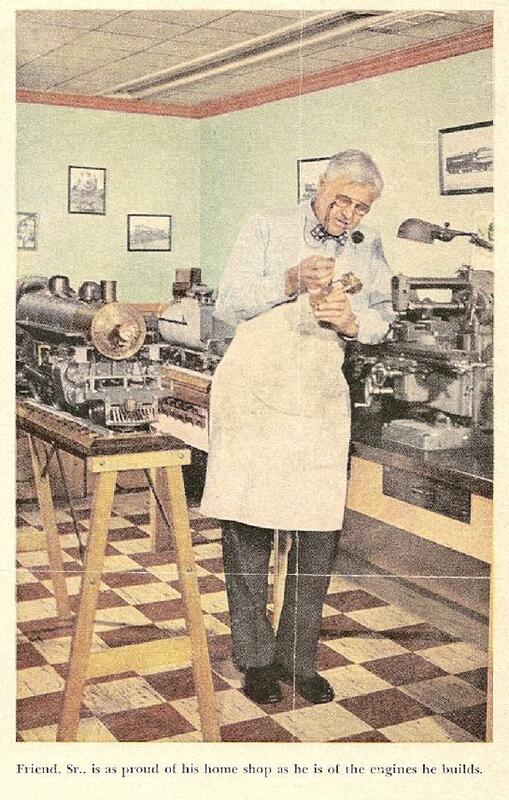 Lester Friend in his home shop in Beverly, MA in the early 1950s. His 1" scale "Yankee Shop" 4-4-2, nearing completion, is behind him. The actual locomotive in this photo, as well as the tobacco pipe in his mouth, can be seen in the other photos, above.